How would you like a sleek, mid-engined roadster for the price of a used minivan stinking of spoiled milk and dirty dogs? The Toyota MR2 Spyder may be your answer. As an added feature, it’s built like a Toyota. The MR2 was the Japanese giant’s most notable on-again, off-again niche sports car. First introduced for 1985, it was an inexpensive, mid- engined two-seater based around the Corolla engine and transmission. A light curb weight and low polar moment of inertia made it thrilling to drive despite its low power and humble origins. A car this fun—and this impractical—was unexpected from Toyota and became an immediate media darling. Sales followed the praise, and the first MR2 sold well during the four years it was available in the States. The original, sharp-edged car was replaced by a new, more aerodynamic MR2 for 1991. The second-generation model was also larger and more powerful than its predecessor. A powerful turbocharged variant was sold alongside the base model, and its 200 horsepower pushed performance to new levels. Unfortunately, the market was changing. Like the Mazda RX-7, the Nissan 300ZX, Toyota’s own Supra and the Mitsubishi 3000GT, the MR2 was too sophisticated, too expensive and in too small of a niche to win the favor of Japanese automakers. Their halos moved to more profitable, broad-market SUVs and other cars. The MR2 was discontinued after 1995, and that slot in the lineup was left vacant. Cut to a few years later: It was 1999, and Toyota was facing a buyer demographic problem. The median age of a Toyota buyer was among the highest in the industry—older than 60—and creeping higher. Realizing the need to appeal to a younger buyer with products that were less expensive and more attractive, Toyota executives launched Project Genesis. The goal: Bring 30-somethings into showrooms. 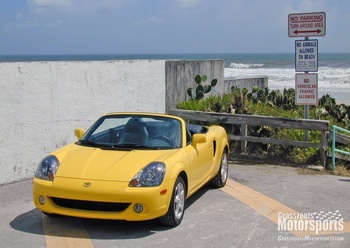 The most unusual of the three cars was the new 2000 MR2 Spyder. It followed the MR2 formula of a compact two-seater chassis, powered by an economy car-derived four-cylinder engine placed behind the driver. Instead of the coupe or T-top roofline of previous MR2s, though, this one was available as a convertible only, with a neat glass rear window and somewhat awkward top profile. It was a stubby car with wheels pushed out to the corners and a bug-eyed fascia. A flat rear bumper accentuated the truncated profile. Under the skin, the MR2 Spyder used a four-wheel MacPherson strut suspension and modest, 15-inch tires. The engine was the all-aluminum 1ZZ-FED found in the contemporary Corolla and Celica GT, producing 138 horsepower. Initially, the only available transmission was a five-speed manual. Here’s the big news: In a reversal of most industry trends, this new car was even lighter than the very first MR2 sold 15 years earlier. The Spyder had a published curb weight of only 2195 pounds. The car was only sold in one version—a monospec in Toyota parlance. There were no factory options, and features such as power windows and locks came standard. About the only thing a buyer could choose was the color. The upshot to all this lack of choice was an attractive bottom line: MSRP was $23,558 the first year. Unfortunately, import restrictions and opportunistic dealers combined to prevent most cars from going out the door anywhere close to that price. This car was more of a contradiction than any previous MR2, however. Many things about it confused reviewers, as well as new-car buyers. For one thing, Toyota attempted to market it toward a younger buying segment, yet the car’s impracticality ruled it out for most single-car households. Unlike past versions of the MR2, there was no rear trunk cleverly fit between the engine and the tail of the car. The Spyder only had a tiny compartment up front, plus some modest space behind the seats. Basically, it made a Miata look like a Mercury. For another, it was sold as a lightweight competitor of the Miata and S2000 but had neither the Mazda’s curvaceous lines nor the S2000’s power. When the car debuted, reviewers liked many things about it, but most could not warm to the whole package. The biggest complaints centered around the odd exterior styling, an interior that looked dated the day it launched, and the lack of storage space. Despite its flaws, reviewers loved the new car’s excellent handling, good power-to-weight ratio and glass rear window. The stiff chassis received high marks for minimizing any handling quirks that might arise due to the convertible top. They also noted the low price and the fact that it was made by Toyota, which implied a high level of reliability. Maybe the MR2 didn’t out-Miata the Miata, but it was Mazda’s first real competition. Today, the MR2 still makes a great alternative to that other roadster, especially if it won’t serve as a primary vehicle. Looking for a reliable, zippy autocrosser or track toy? 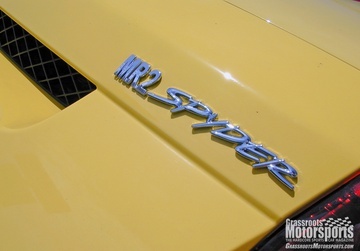 The MR2 Spyder may be the one. The first year, more than 7200 Spyders left dealer floors. By sales alone, the car was a success, although most buyers were not in the coveted younger age bracket. Unfortunately, no other year managed to repeat the first year’s success: Sales tapered off until production ended in 2005, when only 720 MR2 Spyders were sold. The MR2 wasn’t totally consigned to the history books, as Toyota kept it in production for overseas markets for two more years. Overall, it was a success in terms of creating a youthful halo for the Toyota brand, but the MR2 Spyder never seemed to generate the same kind of following as previous MR2s. That’s a shame because there are very few cars before or since that handle as well, regardless of price. The Toyota nameplate and limited production numbers conspire to keep depreciation in check somewhat. The earliest MR2 Spyders are still selling a bit north of $5000 and the latest ones are getting a little more than twice that. Because the car changed so little during production, however, the year can be less important than the overall condition. These are Toyotas after all, and seem to be aging well. How you intend to use the car might very well dictate the year sought. For street, we’d simply buy the nicest, newest one possible. If it’s going to become a modified autocrosser or track rat—or receive an engine swap—then we’d seek the least expensive one out there. Stock-class autocrossers face a bit of a dilemma: Go with the lighter, lower early cars, or sacrifice some weight and handling to get one fitted with a limited-slip differential? The community hasn’t fully answered that question yet. The 1ZZ engine can be very long-lived, as long as it's kept happy. Some issues that make it unhappy include excessive oil consumption, oil starvation and failing precats. A few engines have experienced excessive oil consumption—more than a quart every 1000 miles. This is not a death sentence for the engine: As long as the level is kept up, the car will probably still run forever. Warning: Do not starve your engine. The 1ZZ engines can have oil pressure issues. If taking one on track, keep an eye on the oil level. Like a few other cars from that era, the exhaust manifold-mounted catalytic converter, or precat, can break up from heat, vibration or a combination. The extremely abrasive ceramic can then get sucked back through the exhaust valves and damage the cylinder bores. This is a rare occurrence, but it can—and does—happen. The earlier cars seem more susceptible to this problem. A cat-back exhaust is an easy way to shed some weight from the back of a tail-heavy car. We really can’t recommend one of the sequential-shift (SMT) cars. The upshifts are dog-slow, while the unit’s longevity is just too big of a question mark. The 1ZZ engine takes to boost very well, with both supercharger and turbocharger kits available. The TRD supercharger intended for the Matrix can be made to work in the Spyder—with some cutting of the firewall, the supercharger or both. Turbo kits are available from a number of sources. A potentially more cost-effective solution is to swap in the 2ZZ engine from a Celica, Matrix, Corolla or Vibe. It’s nearly a bolt-in swap, and depending on the ECU and accessories, you’re looking at 164 to 189 horsepower. 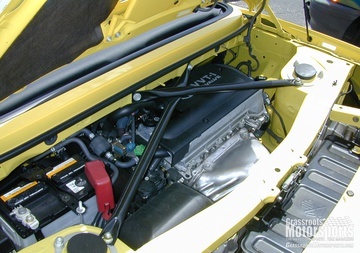 That engine also comes with a six-speed manual that can be adapted to the MR2’s linkage. Budget Lotus Elise, anyone? Also, a side note: We’ve noticed that swaps don’t really impact selling prices. Wanna go a bit nuts? We’ve seen people swap in Toyota’s quad-cam V6. The top has some fragile straps in the rear corners. Inexpensively made replacement straps will cure the problem. The factory tire and wheel package is very conservative: 185/55R15 up front and either 205/50R15 or 205/45R16 in rear. Tire clearance is moderately good, meaning you can get a 225mm tire mounted on a 15x9-inch wheel under there. Fender rolling is always an option. Autocrossers tend to favor the Addco or Saner front anti-roll bar. If the rules allow, remove the rear bar, too. For track use, we like 600-700 lbs./in. front springs, paired with 400-500 lbs./in. rears. The parking brake cables can freeze up during winter. Solution: Don’t use the parking brake during winter. For the sake of simplicity, Toyota limited the number of options available for the MR2 Spyder. As a result, model updates were few and, for the most part, purposeful. 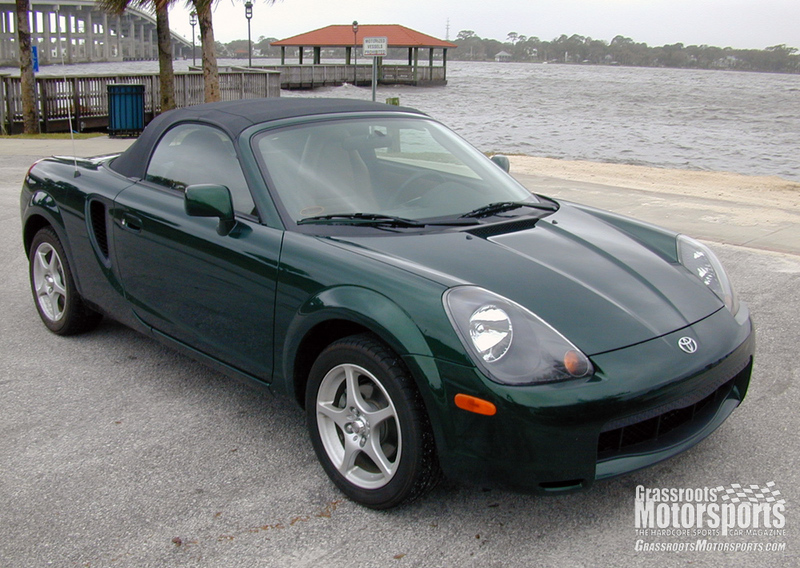 2000:The MR2 Spyder launches with an MSRP of just $23,098. Only one trim is available, and there are no options. A five-speed manual is the only transmission. 2001:A small chin spoiler is added to eliminate the car’s tendency to wander at highway speeds. 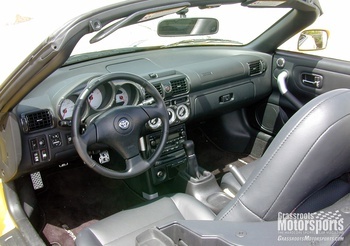 2002:American buyers can choose a sequential-manual transmis- sion, one of the first ones offered in the States. The electronically controlled transmission has no automatic option; upshifts are a bit slow, but the downshifts are nice and crisp. Leather is also added to the option list. 2003:The SMT transmission gains one more cog to become a six-speed unit, while the top color now matches the interior color on leather- upholstered cars. The headlights are revised to incorporate dual bulbs and projector-style optics. Changes to the front bumper and fog lights remove some of the objec- tionable styling elements. The rear bumper and taillights are revised to match the front end, while the side intakes become body colored instead of black. Inside, the gauges gain white faces, and a few other minor changes attempt to update the styling. Rear wheels grow to 16 inches in diameter. 2004:Unibody reinforcements are added under the car, and the ride height is increased to improve crash test performance. Autocrossers, take note: A helical limited-slip differential becomes optional. 2005:MSRP finally inches above $25,000 to $25,145. The cassette player is gone, replaced by a six-CD changer in the dash. At the end of the model year, the MR2 again leaves the American market. So far, that slot in the lineup has remained empty.